Quite often there were massive traffic jambs on the old Central Artery. Vehicles would spill into the downtown streets to avoid the artery, which usually caused complete gridlock in most of downtown Boston. A favorite story of this author is from the early 1990s. The mission one morning was to get from the Sumner Tunnel to the Mass Pike west on a slightly overcast day (less then 1 mile). 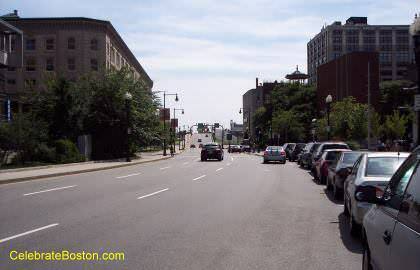 A course was set to travel down Surface Road under the artery structure to High Street, then down Purchase Street, go over the South Station Tunnel, to Albany Street. The Mass Pike on-ramp was just past Kneeland Street. The trip was shockingly swift all the way to Essex Street, and a brief euphoria set-in with the expectation that at least 20 minutes of travel time had been saved. I was then traveling south over the South Station Tunnel, approaching Kneeland Street. Complete gridlock existed at Albany and Kneeland Streets. Each time the infamous traffic light changed to green for Kneeland Street west, drivers would completely block the intersection even though Kneeland Street was at a dead stand still. Thus, when the light was green for the southbound traffic, for 30 of 45 seconds available, three of the four southbound lanes were blocked by cars stopped in the middle of Kneeland Street. This intersection was analogous to a funnel that slowly opened up at the bottom; with zero to ten cars or so squeezing by during each light cycle. On this particular day, the travel time over the South Station Tunnel was 1 hour to drive three blocks, or less than 0.25 miles per hour. Rounded down, that's ZERO miles per hour!